Blissfully set on cliffs of Dover Heights, Wentworth House is a luxury self-catering beach house with spectacular views over the Pacific Ocean. 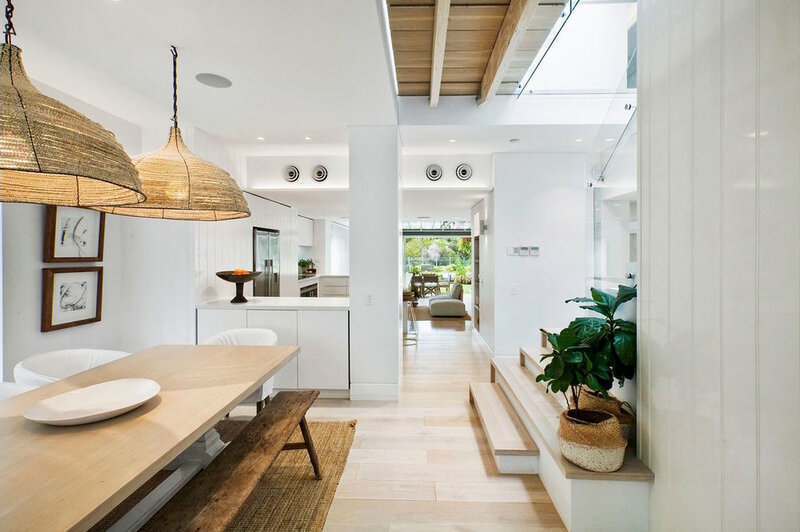 Designed by acclaimed architect Dennis Rabinowitz in 2015, this skillfully conceived home is a sublime seaside sanctuary, perfect for those planning to indulge themselves in the vibrant offerings of Sydney’s eastern beaches. Wentworth House has been stylishly designed using soft tonal hues, which draw inspiration from the coastal landscape. Reclaimed timber details and exposed beams are set against oak and limestone floors, creating a sophisticated environment for relaxation and rejuvenation. Equally as perfect for families as it is for groups of friends, this seaside haven has a master bedroom with ocean views and three other comfortably appointed bedrooms – all with balconies. There is a selection of impeccably styled living spaces to choose from, including a casual sitting area that invites guests to throw the doors open, let the fresh sea air in, and make the most of indoor/outdoor living. Enjoy a morning coffee from the privacy of the covered terrace, or recline on the deck that overlooks the heated pool. Evenings are best spent listening to the waves crash against the cliffs; the perfect soundtrack for a relaxing beachside break. The state-of-the-art Siemens kitchen will ably satisfy any culinary urges during your stay, while other mod-cons such as ducted heating and air-conditioning, underfloor heating and an integrated sound system will help to make your stay more comfortable. You can’t get much closer to the elements than Wentworth House. With direct access to Hugh Bamford Reserve, and nothing but lush vegetation between you and the ocean, the stunning coastal environs of Sydney’s eastern suburbs are yours to explore. Bondi’s laidback beach, shopping and café culture is little more than a 10-minute walk away; the golf club and fine dining restaurants at Rose Bay are also within walking distance. But to see the best of this area, jump onto either the scenic Rose Bay to Watsons Bay walk, or the famous Bondi to Coogee headland walk, not forgetting to stop for an indulgent lunch at the Watsons Bay Hotel or Bondi’s Icebergs.